Homemade peppermint hot chocolate mix! This is hands down the best hot chocolate mix I’ve ever had. Not just ever made. Ever had. It’s perfect. Bold statement I know, but really, it is. It takes about 5 minutes to make and you have a ton of mix. It makes about 20 full servings, but if you, like me, are making mini cups for kids, there’s more than that. And you can mix it with either hot water or milk – it mixes well with either and tastes great. I made this mix last year for Christmas teacher gifts and had rave reviews, so when I started my usual what on earth do I give to the teachers stressing, I decided to just do basically the same thing again. I made regular hot chocolate mix last year, so this year I decided to make it into a peppermint hot chocolate mix. Cause peppermint is better. So hopefully the teachers like it! Does anyone else stress about what to give? I never know. And then you never really know if they like what you give them. I blame Pinterest for the stress factor that goes into gift giving now – everything on there looks so incredibly perfect that it’s impossible to come up with something that seems good enough! Oh well, peppermint hot chocolate mix! Everyone likes that right? I’ll throw in some biscotti too, just in case. So? Everyone with kids – what are you doing for teacher gifts this Christmas? Give me some ideas for next year! Note: This recipe calls for 3/4 teaspoon of peppermint extract which gives a mild peppermint taste to the hot chocolate. If you like the peppermint flavour to be strong, you could add 1 teaspoon instead. This mix can be used with either hot water or milk. In a large bowl, stir together all of the ingredients, except the peppermint extract. Transfer everything to a food processor, working in batches if necessary depending on the size of your food processor. Process until all of the chocolate is finely ground. Add the peppermint extract and process again to combine. Store in an airtight container at room temperature for up to 3 months. To make your hot chocolate, stir 3 tablespoons of mix into 1 cup of hot water or milk. Top with whipped cream or mini marshmallows! What a way to get in the Christmas spirit and the teachers that received this mix were very lucky. Thanks Chineka! And thanks for stopping by! There's not much better than peppermint hot chocolate. Gorgeous! There really isn't right?! Thanks Dorothy! This makes me want to stay in all day and drink cocoa by the fire! Sounds perfect! Yup, that's pretty much what I thought! Thanks Bri! I know right?! Thanks Michele! Thanks Mira! And thanks for the pin! This is such a great gift idea! Peppermint hot chocolate is my favorite!! Love the sound of your recipe, I'm definitely craving a cup now and can't wait to whip up a batch of this! Thanks Kelly! I like my hot chocolate way better with peppermint too! Hope you like it! Peppermint hot chocolate is the best kind of hot chocolate! This looks wonderful! Peppermint really does make hot chocolate the best doesn't it?! Thanks Rachel! This sounds like a perfect gift, to me!! Those teachers will be very lucky to receive such a thoughtful and delicious gift! My daughter is home this weekend, for some good old-fashioned holiday fun, I'm going to make this for her! 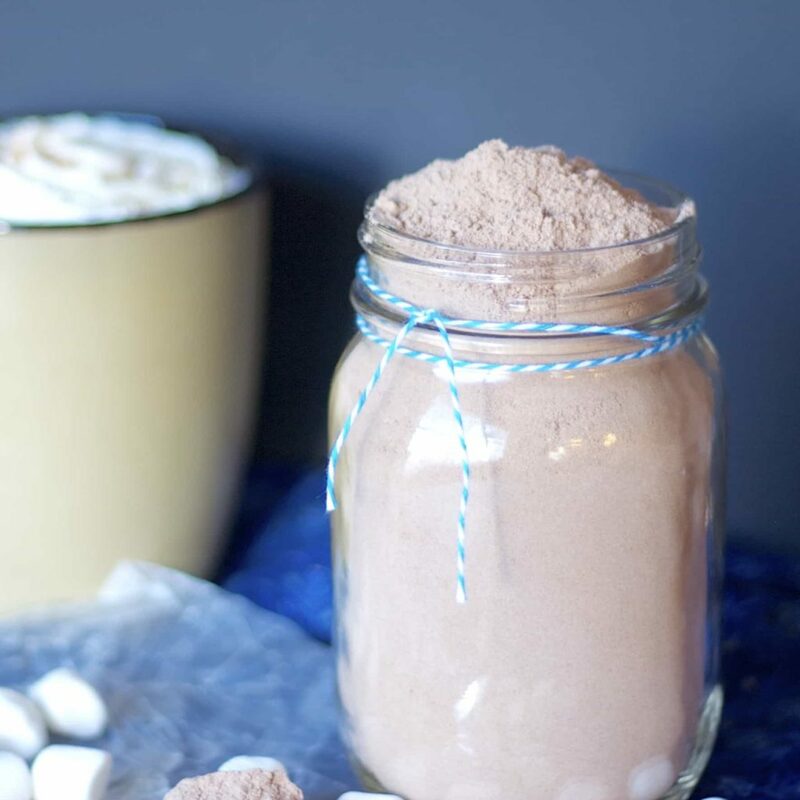 I've never made homemade hot cocoa mix, but I love the idea of formulating my own - it probably tastes so much better than the store bought packets because you can sort of customize it to your own tastes! This is such a great idea for gifting! I am a huge hot chocolate fan so I'm always looking for new recipes! Can't wait to try this peppermint version to warm me up! Haha, that's what I figure! Thanks Matea! These make such cute gifts Stacey! :) I still have a box of homemade peppermint hot chocolate mix in my pantry and I keep drinking it everyday!! Thanks Manali! It's such a great drink to have in the winter isn't it?! It is, I tried it with semi-sweet chocolate as well, and it just doesn't mix in to the hot water as well. The white chocolate makes for a better mix for sure. Thanks! Peppermint hot chocolate is one of my favorite drinks in the winter! 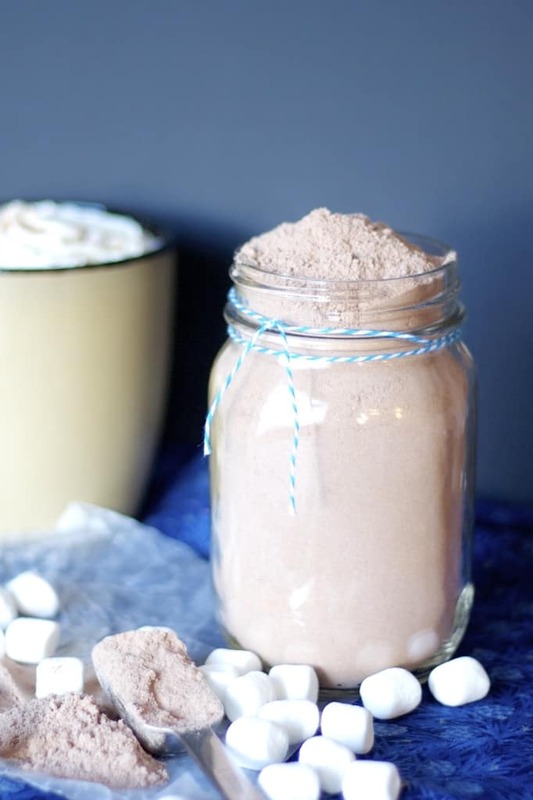 I've only made hot chocolate mix once, but this looks super easy and so tasty! It IS super easy, I was really surprised at how quick and easy, and tasty, it was to make! Thanks Ashley! This in such a fabulous gift idea! I love that it's peppermint! What a fun gift for the holidays, Stacey! I love getting homemade hot chocolate mixes, their so fun! Your peppermint version sounds fantastic! It's my favorite flavor for the season!